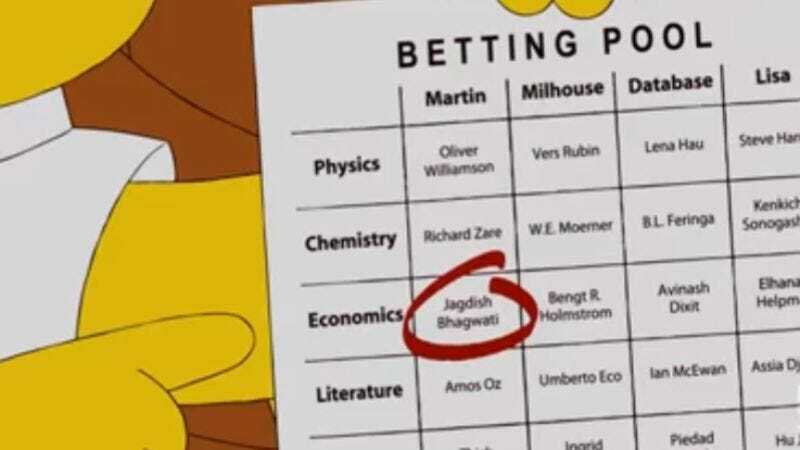 As the product of America’s finest collection of aggressively educated, detail-obsessed joke writers, it’s not entirely surprising that The Simpsons might do an extended gag about a betting pool for the economists vying for the Nobel Prize. Still, whoever pitched Bengt R. Holmstrom as Milhouse’s pick in 2010’s “Elementary School Musical” probably got a nice little thrill Monday morning, when the MIT professor was named—along with Harvard’s Oliver Hart—the 2016 winner of the Nobel Memorial Prize in Economic Sciences. This is actually the second time Milhouse has successfully predicted Stockholm’s pick. In 2014, W.E. Moerner won the Nobel Prize in Chemistry, putting Bart’s best friend 2-0 over Martin, Lisa, and Database. Beyond the absurdity of Milhouse ever winning anything ever, though, the lucky guesses are presumably owed to the writers stacking the deck with well-known minds. We can only guess how astronomer Vera Rubin and politician Ingrid Bettancourt—not to mention Jagdish Bagwhati, the episode’s fictitious pick for the economics prize—are feeling right now, knowing that the eyes of history (and Van Houten) are upon them.